Note to self: a planet opposite a stellium is opposite all the planets in the stellium, even the ones that are officially out of orb. I thought Pallas was out of Pluto's reach for the time being, but I hadn't counted on the Moon, Mars, and Jupiter bridging the gap and carrying Pluto's malevolence to the peace of Pallas. Had I looked for this possibility, I might not have missed the carnage this past weekend. Most of us in America probably had a fine weekend. In Nigeria early Saturday morning, however, persons presumed to be political terrorists massacred children at a boarding school. The next day, followers of deposed Egyptian president Morsi fell victim to a massacre. Gun-controlled Chicago saw a record 72 shootings over the weekend, a high number even for that most violent city. We also had not one but two plane crashes. The first was on Saturday at San Francisco International Airport. The second was a smaller plane in an Alaska airport. Most of us in the US probably enjoyed a nice, warm holiday weekend, but certainly something malevolent was in the air... or in the skies. Here is a chart of the morning of Saturday July 6, 2013. Note the aforementioned stellium, opposite Pluto (even if it's not a "proper" stellium, Mars is quindecile Pluto). That Pallas is conjunct the ruler of the Sun is a nice mitigating factor, but this ruler is the Moon: Pallas-Moon suggests warriors or persons prepared to fight. We know already that Pallas in any connection with Pluto can be an enabler of violence. Neptune is widely (five degrees) quincunx Venus and widely trine Venus' ruler the Sun: nice for creative energies but dangerous in combination with other factors. Those other, final factors are present here: Pluto is opposite the Sun, quincunx Venus, and opposite Mercury which rules the Moon. All of these factors together comprise an astrological blueprint generally present in the natal charts of mass-murderers. When the entire formula assembles in the sky, we see an increased likelihood of bloodshed. This configuration helps explain Nigeria, Egypt, and Chicago. It may not necessarily jibe with the two plane crashes, which were ostensibly accidents. I haven't researched plane crashes, but more mainstream astrological thinking gives us some clues: the lingering Sun-Pluto-Uranus T-square brings unexpected destruction. The proximity of Jupiter to the mix suggests travel, and the nearness of Mars to Jupiter suggests possible contention with travel. A few years ago when Jupiter conjoined Uranus, we saw strange surges in electricity happening in nature, killing schools of fish and flocks of birds. Jupiter is now approaching a square with Uranus, possibly bringing the phenomenon back to us, and dangerous currents back to the skies. 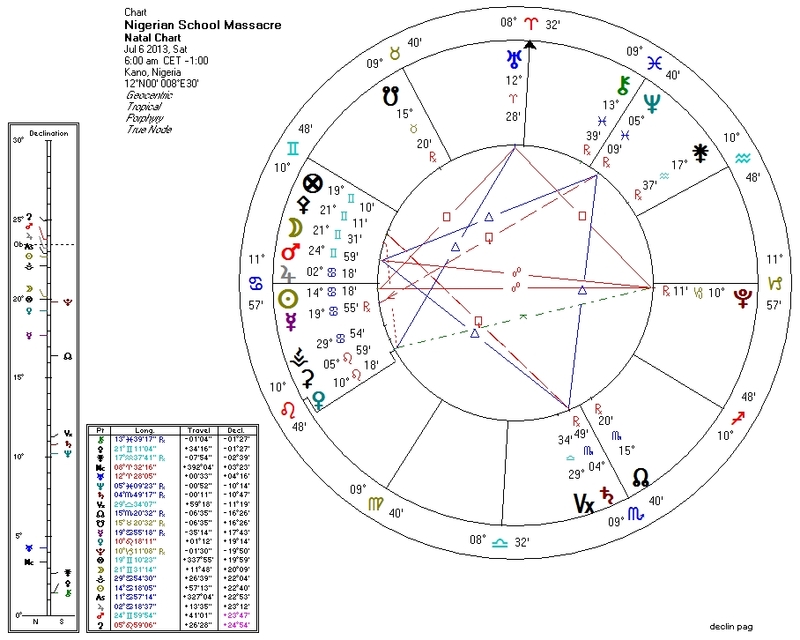 Back to Pallas and Pluto: with various planets bridging the gap in the opposition, the two bodies are effectively connected from now through most of August. When Venus and the Sun line up in any number of configurations with Neptune and Pluto on top of this, we might see more violence. It is no great leap to suspect that significant violence might erupt after the Trayvon Martin trial if the jury fails to convict George Zimmerman. Being a committed Palladian, I hope very much to be wrong.